We slowly settled into riding on the 'wrong side' of the road in Britain, though we still both felt a little brain-damaged by the challenge. It is odd to take something so fundamental that it is almost hardwired in your brain, like how you cross a street, and reverse it. We added a layer of learning to our brains with the new experience in Britain, but a deep part of us will always know it is wrong to ride on the left. And I am also confident that when we return to the Continent, that we will instantly drop our new 'left side' learning like it never happened because of the decades of riding and driving on the right side of the road. It was amusing to watch how easily our new confidence in riding on the other side of the road was jarred. We'd be doing fine, then pass by a row of parked car with some pointing in both directions. Suddenly, we couldn't tell you if we were on the correct side or not. One-way streets were equally disruptive to our fragile confidence as pedestrians. Just when we thought we had the hang of which way to look for oncoming cars, we'd happen across a one-way street with its traffic coming from the other direction and we'd be confused again. Our new skills seemed to have no tolerance for exceptions. We didn't move our rear view mirrors to the ride side of our heads, though that is where they should be in Britain. It was so jarring and sometimes dangerous to have all of our reflexes in traffic be wrong, that keeping the mirror where it has always been retained at least one constant in our muddle. We just turned our heads a little farther to see all that we needed to see in the mirror. Welcome reminders for foreign pedestrians. It took a month of riding before we could ride on the left side of the road with reasonable confidence. There was still some hesitation out in the middle of complex intersections and a rare drifting over to the other side on lightly trafficked roads, but we were definitely riding with more ease and consistency after the first month. And it took about a month for the invisible repulsive force that prevented me from snuggling up to the left edge of the pavement to dissipate. It was so odd--whenever I tried to ride on the very edge on the left side of the road, I would get agitated and wobbly--but that too has improved. 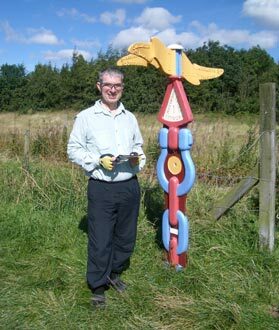 One of the colorfully painted route markers. Our first couple of weeks of biking in Britain before we went to Iceland had been so difficult that we had considered cutting short our bike adventure on the island for safer conditions on the Continent. The one-lane back roads we expected to be cycling heaven were heavily used by motorists and the hedgerows left us with no where to hide. But aided by Penny Kelly's research on bike routes, Map Man was able to find us less hair-raising riding. And as we headed north, he supplemented her information with a Lonely Planet Cycling Britain book for more lodging options, and some National Cycle Network maps for additional routes. Thus armed, our second attempt at biking in England was radically improved. Lodging was tight and confined our schedule, but the traffic situation for us was vastly improved--we were actually enjoying ourselves, as we had hoped we would. The national bike routes were generally well marked, though like any country's bike routes, traversing them ranged from idyllic to irritating. Sometimes we pedaled miles and miles on lush, sequestered railroad beds converted to trails that were traffic free and effortless to follow. But some corridors required a dozen dismounts in a day at rail-trail intersections with streets where the rail bridge was removed. We'd go down a steep bank, stop at the bottom and thread our heavy, bulky bikes through too-tight metal and stone barricades designed to keep motorbikes out and then be faced with a 13% upgrade from a dead start on the other side. The worst of these were on deeply eroded, coarse gravel paths with 6-8" ruts in the loose surface. On other stretches, the train bridges were intact and we negotiated less restrictive motorcycle barriers without dismounting. Some stretches of the bike routes guided us along rolling, paved farm roads with so little traffic that they invited day dreaming. Other segments of the route would dump us onto rough dirt paths with alternating stretches of chunky gravel, deep puddles and mud which demanded all of our strength and concentration and left us hoping to emerge without looking chocolate-coated. Every day was a surprise. The special bike route maps indicated paved or not paved, but the quality of the unpaved surfaces covered a huge range, from "Yes!" to "Never again!" There isn't a country we've been in where the bike route signs (if they exist) haven't sometimes left us scratching our heads, and Britain was no exception. Early in our trip we happened across some yellow spray-painted arrows on the pavement. It didn't take long to understand that some self-righteous individual like myself had taken matters into his or her own hands. For the better part of half a day, we smiled with appreciation as those yellow arrows appeared at each junction where the official signs were inadequate. 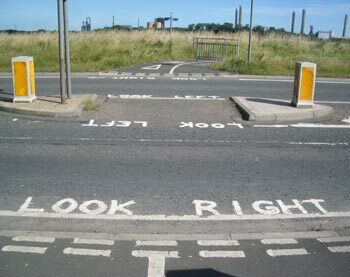 In the weeks ahead when we struggled whether to turn right or left or should have turned where there was no sign, we often longingly thought of our southern route advocate with the yellow paint. But despite some shortcomings, Britain's bike routes rank among the best we've been on. We have learned that following bike route signs or even road signs is an craft that must be retooled in each country or region. The conventions as to where a sign is placed in relation to a turn is a little different from country to country, and the placement is different for car and bike signage. We have to learn the fine points of sign placement style in order to know where to be looking for them. And in one country we believed we could tell when the person who was placing the signs changed, as there were marked differences in the height of the signs and how they were located on the road. Another skill Bill mastered early in our travels that we still use is recognizing the bike route signs from the unpainted back side. Often routes are better signed for people traveling in one direction than the other, so being able to spot the signs for the travelers going the other way was sometimes all that kept us on the route. 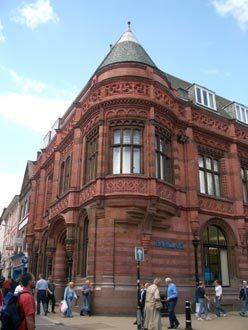 Fancy brickwork on a York bank. The social climate on the posted bike routes varied with the nature of the route itself. On the converted rail corridors nearer the towns, we often enjoyed a sense of community with the walkers. And on these trails we often admired and sometimes visited with the dogs that were dragging their owners out for some fresh air. Friendly black and white border collies originally bred for sheep herding were the breed of choice for families with small children. And away from the areas favored for dog walking, we happened across more bird watchers than we've seen in any other country on our back roads sojourns. These serious birders packed along monoculars on tripods that looked like sawed-off telescopes and stationed themselves on folding camp stools. We looked but couldn't appreciate the objects of their attention with our unaided eyes. And we often found ourselves sharing the roads or paths with a record number of equestrians. But unlike with walkers, the equestrians didn't seem to have the time or inclination for visiting. The visual changes as we moved north through Britain came slowly. In the south of England, brick was the building material of choice, especially for projects dating from the mid 1800's and early 1900's. In northern England and southern Scotland, the brick dropped away and dusty rose sandstone was everywhere. In the south, the geography shifted between the flat fens, the rolling wolds (woodlands), and the chalky heaths. And a few days later, we rode through rolling pasture and cereal crops. At the border with Scotland, the terrain became more up and down and the highest hills we'd seen on the island began looming in the distance. 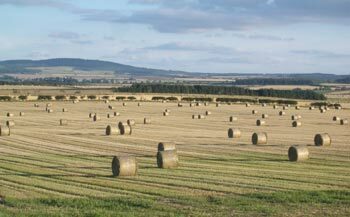 Hay rolls still in the field--a common countryside sight. In the south, we understood most of what most people said to us but as we traveled north we often mistook English for very foreign tongues. And in Scotland we found ourselves digging deep into our foreign language skill basket to recognize enough spoken words to guess what was said to us. Guessing what was said was made even more difficult as the common expressions were different, like "It's a grand one isn't it." for commenting on a beautiful day. Though we didn't always understand the spoken language, we of course could read all the signs. And the common postings were different than in the States. Literally dozens of times each day we saw "No dog fouling" (poop), "Public Footpath" (as public access for walking on farm land is a hot issue), and "CCTV in use" (closed circuit television.) Bill read that the Brit's are the most surveillance-photographed people in the world, and I believe it. Our mugs must be captured on video tape a few hundred times a day. The signs and cameras are literally everywhere. Our B&B's often had a camera focused on both their front and back doors and I spotted a post in a public area supporting 5 cameras. We see the cameras or their disclosure signs on sidewalks and on buses, as well as in and out of businesses. Rarely is anyone monitoring them that we know of, but the tapes are reviewed if a crime is reported. 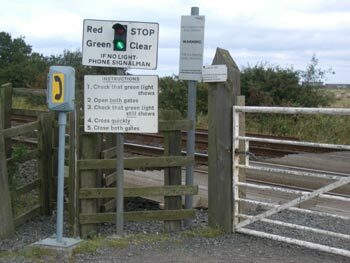 An unattended, gated rail crossing with a call box. In contrast to the intensely used CCTV high technology, we were stunned at the sight of low tech, manually operated rail crossing barriers in some rural areas. We would patiently wait until the tender came out of his little rail-side building to open the gate so we could continue on the road. Rarely, we were allowed to let ourselves through the gates. And at even more intersections, long, slow moving vehicle operators were required to stop and phone the tender for permission to cross the tracks. Queen Victoria or "Madame Infrastructure"
A thirty-ish British cycling couple provided the missing story line for some of our earliest images of England, especially some of the history behind the punishing, overloaded back roads of southern England. According to them, the horrific road congestion in the southern reaches of Britain has its origins in a 1960's scandal. They remembered the name of the man that headed a report concluding the railroads should be scrapped and instead the transportation system should focus on moving people around by buses. As a result of his report, 80% of Britain's rail lines were abandoned. Of course, then they discovered that the roads were insufficient to handle the load as many people used their cars instead of the buses. New roads needed to be built to handle the traffic influx and the author of the report profited, as he was the owner of the big road construction company in the country. The transportation system never has recovered, though we have enjoyed quiet cycling on the many abandoned rail lines that were recently converted to bike routes. They went on to tell about an uproar in the 1990's over the price of water from the recently privatized water distribution system. To appease the public outcry, an investigation of the water system was eventually undertaken. It was determined that a third of all the water transported was leaking out of the more than hundred year's old plumbing network, adding significantly to the cost of water. And apparently many of Queen Victoria's other projects are showing their age from a massive case of deferred maintenance. It took a day or 2 for that shocking statistic about the water system to sink in but when it did, we realized that their 'porous' water distribution system meant that contaminants were also actively leaking into their system at a horrific rate. That new piece of information collided with my recent wonderings if the slight but recurring GI discomfort we were experiencing in Britain could be caused by low quality drinking water. (And I'd noticed more than one public rest room sink with a sign indicating the tap water was not potable.) After learning of the wide spread use of lead in English plumbing during our Lincoln cathedral roof tour, we were already letting the tap water run a minute or 2 before drinking it to clear any lead concentrations from the lines. But alarmed and armed with this new information about the water system, we decided to buy water purification tablets in Edinburgh to treat our drinking water. I am sure the residents in each community have a sense of their water quality, but as travelers we aren't privy to that regionally specific information and will resort to the shotgun approach of treating it all. The Brit's, like all of us, have their challenges and problems. Their infrastructure problems haunted us with water, rail and road issues, but the first societal issue we noticed was the obesity on the streets. Unfortunately for them, the Brit's are in league with the US for a high incidence of obesity. They have the unwelcome distinction of being the most obese nation in Europe, and not surprisingly, also have the highest incidence of stroke and heart disease in Europe. Three-fourths of Scots over 45 years of age have high cholesterol and in addition, the Scottish suicide rate is double that of England. The heavy use of alcohol through much of Europe raises our eyebrows, but even more so in England. We see less public drinking in Britain than in some countries, but because of the shared language, we hear and read more about it as a social issue than elsewhere. Four pints of beer was the number than came up for an evening's imbibing in our guide book, on a TV program about the day in the life of a salesman, and from a B&B host talking about his son. To us, 4 pints of beer is a staggering amount to be such a standard reference point, especially with its higher alcohol content than US brews. But one new report revealed that 10% of the drivers in a random alcohol check (legal here though not in the US) on a Saturday were over the legal intoxication level for driving. And Bill was less than sympathetic when making reservations at a B&B when he was told by the hostess that she couldn't give him directions to the place because she was too hung-over. Interestingly, smoking rooms were the exception in B&B's in England. I overheard a booking agent tell 2 tourists that it would be hard for her to find them a smoking room. About the only accommodations we stayed in that allowed smoking in the rooms were 'purpose built' motels. We guessed that the restriction was driven by fire safety and not by their public health campaign to reduce smoking. And we loved that we didn't have to worry about 'smoking' the electrical system in our rooms at night with our cook pot as every room we rented had a hot pot for making tea or coffee. Usually their kettles were torches drawing 1500 watts or more. In addition to that convenience, we appreciated other British traditions, like museums being open 7 days a weeks, as were most grocery stores and the total lack of lunch time closures in any businesses we dealt with. Usually we don't see abrupt geographical changes with political boundaries, but the terrain did immediately become hillier where we crossed from England into Scotland. And about 50 miles south of Edinburgh, the rolling Scottish hills took on the look of the foothills of the Alps. These northern reaches were covered by glaciers during the last Ice Age, and the steep slopes revealed their glacier-carved past. Conifers began appearing in the mix of trees and more substantial woodland clumps came into view. The baked-brown look of grain fields ready for harvesting were being replaced by lush green pastures dotted with grazing sheep, cows and occasionally horses. The big brown patches are a mix of bracken ferns and heathers. We quickly left the pasture lands behind as we climbed towards the 1350' high-point on the route from Newcastle, England to Edinburgh, Scotland, as the landscape changed to intermingled patches of purple heathers, hardy upright ferns and uncultivated grasses. Though the mix of vegetation was distinctive, the look in the distance of these steep, bunchy hills and low growth could have been anywhere. The occasion clusters of windmills reminded us of those we had seen in the Greek high hills; the sinuous path taken by the loose stone fences on the steep slopes transformed the look to that of Croatia, and I wouldn't have questioned it if someone said this was northern Spain. The chilly wind on the rare, bright, sunny day gave it a feel of higher mountains than they actually were. The more Alpine look of the terrain brought to mind that we were actually missing the challenges presented when we had traveled in a non-English speaking countries. Yes, it was definitely easier to be surrounded by English speakers and we loved the more sophisticated conversations the shared language afforded, but the foreign languages had added some pizzazz to our days to the Continent. No matter how delightful the region, bike touring does have its dull moments and we began remembering how we often filled those intervals by working on the language of our host country. Sometimes it was straining to guess the meaning of a word that recurred on signage, sometimes it was drilling each other on numbers, or perhaps we would practice the usual string of sentences needed to rent a room for the night. Deciphering the occasional heavy Scottish accent just didn't have the same rewards as learning a few more words in Italian or French. The distinctive Scottish accent wasn't the only Scottish stereotype we spotted, as men in kilts, men in tartan plaid pants, and golf courses were common sights. The Scot's invented golf, which is easy to believe as it is literally integrated into their lives. We spotted a number of people on Edinburgh streets carrying a single golf club along with their briefcase or groceries. And the reason became clear: one of the city parks that is crisscrossed with foot paths is actually a golf course. It was a low-key affair and I doubt that people were even paying to putter around it, but it felt a little dangerous to be walking among flying golf balls. And I found myself grateful to be wearing a helmet and pulled my head down on the several countryside roads that meandered through the middle of small, informal golf courses. In addition to golf, fishing and days-long walks in the countryside are passionate pastimes in Scotland. One man explained to Bill about the "gillies" that are fellow fisherman who are hired to patrol designated strips of river bank. We assume that they check the anglers for fishing licenses along with coaching them as to the best spots as they stop to share a toddy available from bank side vendors. And we've ridden by small buildings that look like club houses for fishermen. It's a very different style of fishing than a guy who sits alone in a boat all day. Unlike the gillies for the anglers, the support for the walkers is less elaborate and seems to be more in the form of an ample supply of route maps, books and the occasional signpost. The 6,500 going on 8,000 mile long National Cycle Network bike route that wandered through golf courses and over angling streams took us into the heart of the Edinburgh. The amazing city route portion was on quiet streets and dedicated bike ways, with only a couple of difficult intersection crossings. We arrived on what one local described as the second of 2 nice days this summer and we leisurely ate our picnic lunch in a huge, grassy park in the middle of town with the neighbors. We immediately felt at home in Edinburgh. Fortunately, our route had taken us to the doorstep of probably the top bike shop in Scotland. It took some coaxing to get the young clerks to call the manufacturer's rep about my expensive, 6 month-old bike saddle that was literally coming apart at the seams--definitely an American, not a European problem solving approach. I felt like I got the good customer service that I was entitled to, though the staff were dumbfounded when the rep authorized them to swap the saddle straight across for a new one. I was happy and their openness to my suggestion had taught them a new trick in the 'biz'. The young men then gave Bill all the help he needed in the difficult process of selecting a new helmet as a few days earlier he discovered his was cracked. A visit to the Scottish headquarters of the cycle network folks gave Map Man the information he needed to finalize a cycling plan for seeing more of the country. And a stop at Tiso, the outdoor outfitters in the city, yielded the replacement we needed for the flat little can opener I had just lost and chlorine tablets for our drinking water. These are the kind of chores that often consume too much of our time in the cities, but Edinburgh was unusually obliging and our "To Do" list rapidly melted away. 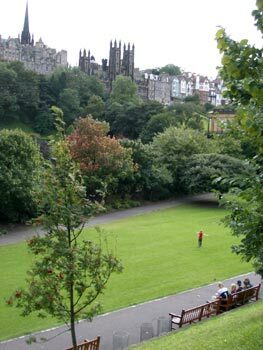 City center park in Edinburgh. Like Portland, Edinburgh has about 400,000 people, which is a comfortably sized city for us: big enough to have the resources we need and small enough to easily access them. And Edinburgh struck us a very easy place to live. The feel on the streets was lively and energetic but not frantic. There wasn't the press of people that makes it fatiguing just to be out and the many open green spaces made it effortless to take a break in peace and quiet. We could easily move between the noisy commercial spaces that re-supplied us and the calm spaciousness of grassy expanses lined with wooden benches and trees--a delightful juxtaposition serving 2 very different needs. Our upbeat experience in Edinburgh was topped off by spending a satisfying day at the national museum with friends formerly from Portland. But unlike most museum visits where we spend hours in near silence reading the fine print inside endless rows of glass exhibit cases, this museum gave us the comfortable space we needed to sit and talk for hours. Aside from the expected pleasures of connecting the long time friends, we enjoyed the opportunity to leisurely compare notes with fellow Americans. They of course updated us on the state of politics and the economy in the US, from which we are increasingly removed. But their many travels have taken them to more corners of the globe than we have reached and it was fascinating to swap impressions generated from our respective travels that have shaped our individual "state of the world" opinions. Interestingly, China and Russia topped the list of nations to watch, with us all having more hopefulness for China than Russia. Of course, these heady topics were interspersed with lighter detours, like hearing of their results from testing the online recipe for batter-coated, deep fried Hostess-brand Twinkies (sugary cupcakes). This visit with friends was planned, but the next night out was a complete surprise. A Portland area friend had hurriedly emailed us contact information for a co-worker currently living in Edinburgh. Bill called early in the evening to discuss some route questions and a half hour later we were at their house for dinner. The company of the California couple and their three kids and sweet dog made for a fun and lively evening. And the "small world" phenomena caught up with us as our host also had a bike frame built by the frame builder we used for our touring bikes. Bill took in their information and experiences from living in Scotland for the last 2 years in developing Plan C for our Great Britain tour. Plan A had been to take the ferry from Aberdeen, Scotland to Iceland and back in the early summer. Plan B had been to travel north to Edinburgh in late summer, then turn around and head south again. But too many admonitions not to leave without seeing northwestern Scotland prompted Plan C. After talking with a number of people and surrounding himself for a day with maps and lodging information, Map Man developed a plan for seeing more of Scotland but taking into account the withering of the almost nonexistent summer weather. The compromise Plan C called for taking the train to our new northern-most point of Inverness and biking south, initially on the promised-to-be-stunning northwestern coastline, then cutting across the midline of the country to connect with the best of the bike routes, #7. As near as we could tell as first-timer's, that would give us a representative sample of Scotland's diverse looks and terrains. It would also reduce our time spent in the wetter and windier western side of the country. Reluctantly, we let go of our mad dash to Spain with its temperatures still reaching the low 80's and hunkered down for a month where the highs would only be in the 50's. At Inverness we shopped and repacked for being in chilly, wet weather in the "boonies." We knew for at least the next 10 days our shopping opportunities would be sparse and that we were at risk of rain everyday. Any lingering summer weather gear that was being kept in readiness was relegated to the bottom of the panniers and the full range of wet weather accessories were now poised for service. Bill bought a heavier pair of socks and out came the heavy gloves for the frosty mornings. The single-use, chemical toe warmers we've been hauling around were also moved to the top of the heap. And we knew that village park benches and bus shelters couldn't be counted on to add comfort to our lunch stops, which would likely shift from leisurely seated picnics to hurried snacks eaten standing up. Our route would take us a bit north of Inverness as we headed west to the coast and then onto the Isle of Skye. Bill selected some sights to see on Skye before we would head south via a 30 minute ferry ride back to the mainland. On about Day 10 out of Inverness we would be back to our first city, Fort William. At Fort William we will head east to hook up with the bike route. 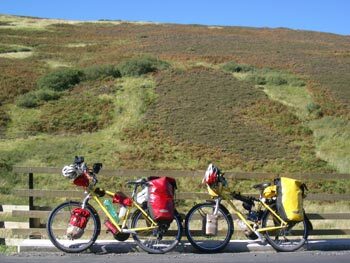 Our western Scotland trip will take us off of the comfort of the the bike routes. Once again we will be out in traffic on a route crafted by Map Man. The young man at tourist confirmed that these would be shoulderless roads, though the traffic would steadily decrease each day as we moved into the more remote areas. Fortunately, about 1/2 of the route is served by trains, though it's not an interlinking system. And since Bill's knee isn't 100% yet, we are still keeping backup plans in mind. But his knee continues its steady recovery and we are increasingly confident that it will completely heal. Hopefully the only lingering part of this knee episode will be Bill's increased understanding of how my riding style is necessarily different from his because I have less physical strength. I've explained the issues with words, but there is nothing like feeling it with your own body as he has now done. He experienced riding with only his left leg as well as riding with partial power from his right leg for about the first 2 weeks of his recovery. Then his overworked left leg finally complained and he pedaled with partial power from both legs for a couple of days. He now has first-hand experience with riding in a variety of terrain with a broad range of available 'umpf' from his legs and I'll never again need to explain my different abilities to him. Ah, back in civilization at Fort William in western Scotland. Bill's knee survived its unexpected trial by fire in the exhausting headwinds and the steep terrain of the western Highlands and we now know more about riding in the wind than we ever cared to know. With the fall equinox just behind us, we are glad to at last be riding south to slowly make our way to Spain. But we have a lot of sights left to see in England, so we don't yet know when we'll be leaving Plymouth on the southern coast of England for Santander, Spain. pronged adaptors for the UK. The adaptors can be purchased in Britain, but not just anywhere. Bill also liked using Ordinance Survey maps, available in book stores. notoriously difficult to establish until you are ready to hop on.